Technology in service to nature. Of all the Earth’s natural resources, water may be in the most critical danger of falling short of our needs. Water shortage is a critical issue in many places, and the entire world is destined to feel the pinch. Since the Hi'ilani EcoHouse harvests rainfall for its water, it must use every drop as efficiently as possible. Toilets consume much of a home’s water, so finding a toilet that flushes effectively while using less water has been a top priority. Our search for the world’s most efficient toilet led us to Niagara Conservation Corporation, where innovator Bill Cutler has created the amazing Stealth® toilet. 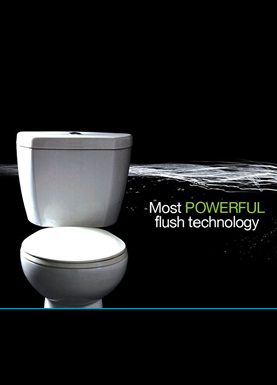 In recent years, high-efficiency toilets have reduced water usage to 1 to 1.6 gallons per flush, although the noise they make can be startling because of their pressure-assisted design, and some may require repeated flushing. With Cutler’s innovative vacuum-assisted technology, the Stealth can remove 800 grams of material, using only 0.8 gallons of water per flush… and it is quiet! With Stealth toilets in every bathroom, the Hi'ilani achieves a 20% reduction in water use compared to the best previously available toilets. Nothing else matches the Stealth’s balance of efficiency, effectiveness and quietness. The ingenuity that generated The Stealth Toilet is also found in more Niagara Conservation products that save water indoors and out, and that reduce the home’s energy consumption.